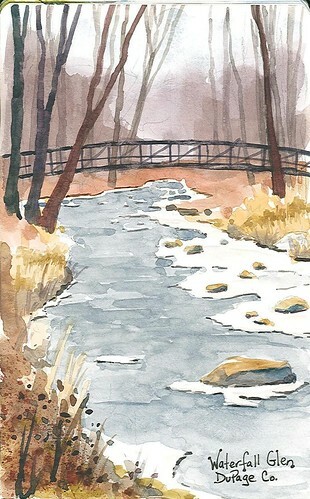 Stream and Bridge Watercolor Sketch – Waterfall Glen – Let's Paint Nature! This is down stream from Waterfall Glen. You might remember last year’s sketch in the springtime. With this sketch, I tried to get layer upon layer of watercolor distant trees to convey depth. 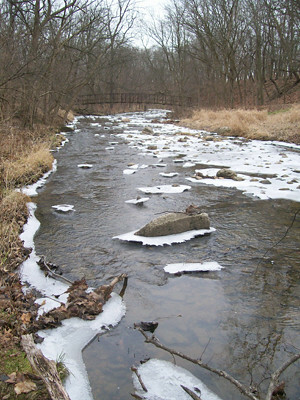 I also love the way the stream is partially frozen, the bright white ice is the paper showing through, very easy to do! I did this sketch from a photo and in the comfort of my nice warm home. Here is the photo. Sketching outdoors if fun, but sketching from a photo has its benefits too. With this I could take my time, my paper dried fast, and enjoy a glass of wine while listening to classical music!!! Do you prefer to sketch from a photo or en plein air and why? Very nice watercolor sketch! It looks beautiful and icy. Thanks! Yes…very cold, but warm in my home when I did it…haha. Looks cool – pun intended. I am especially fond of the trees in the distance (though I like the waterside plants in the lower left also); nice sense of depth. haven’t done enough open air sketching to own grounds for a preference; I am just used to working from photographs. it always seemed to me to sport a greater flexibility – and, believe me, I need all the leeway I can get. Lol, yes I too need a ll the leeway I can get! Thanks so much! If the best I can do is look at your sketch paintings to feel better at this desk in Hell, then I accept that and thank you for creating them. Well, I’m glad I can make it a little better! I prefer to sketch from a photo most of the time because sometimes the weather is a factor and sometimes looking at something in 3D is very hard for me to get perspective – but I like plein air because of the experience of being outside – so when I do paint plein air, it’s more in the spirit of “play” than making art, although I have had rare occasions (with you) when I did make some art. Usually, I am not satisfied with my painting when I paint plein air. With a photograph, my subject doesn’t move around like it does when I’m outside because I’m always moving. Good reply, both are beneficial to practice outside and inside. I too love the experience outside, it brings me closer to nature and to God. Christine — I need more instruction on how to use the micron pen to make my sketch paintings “pop”. I’m trying to use a micron on The Blue Truck by outlining the flowers in truck bed but I KNOW that if you were painting The Blue Truck, you would be making different decisions than I am – can we talk more about using the micron pen at the next Meetup? I learned something by seeing how you did the trees from the photo. The sketch is quite nice and am sure would be a lot more difficult to do if on site. I tend to do all my sketching on site just because I am using the sketch to remember what I had seen. Awesome! I’m so glad I can help by just displaying my sketch and photo. That is my intent and why I always try to show a reference photo. Thank you! Oh yesssss, the wine definitely helps, with or without painting!